Usually, I have tons of spare paper around. It comes with the job (student, programmer). I also like to fold. 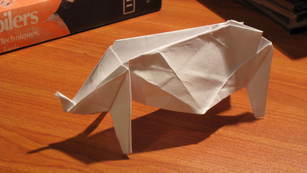 So when I’m thinking\resting\doing anything, I usually pick up a piece of paper, and start folding. This time, while doing compilation homework, I came up with two nice folds. Problem is, I don’t remember the way to fold them. If I want to find out, I’ll have to reverse engineer my own fold. That actually happens quite a lot to me. Maybe I’ll just open them and try to solve them as a crease pattern… It’s about time I learned how to do that. 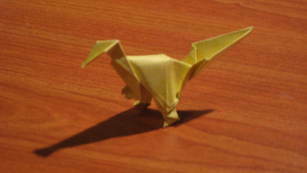 Of course, anything I fold doesn’t really look as good as anything by ‘the masters’. Still it’s fun to fold. 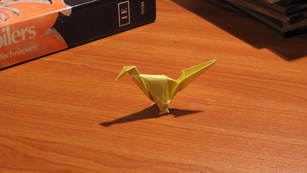 This entry was posted in Origami and tagged Compilation, Origami, rhino, road-runner, velociraptor. Bookmark the permalink. road-runner? dude, that’s a Velociraptor! It does have the right shape… Alas! I believe velociraptors have ‘hands’. Or at least something very similar to hands… Now that you mention it, I’ll try to fold one, with all limbs in place. Thanks!